"This is ROBERT HARMAN (Bobby) and, as an attachment to this email, I am sending you my PS 99 Kindergarten picture from Dec 1948. I believe you need this one for your PS 99 files. I am the boy with the striped tie in the very front row. People that I distinctly remember from my class include: The girl right next to me in the front row is SUSAN HORN. The boy to her upper left, with his elbow on the table is JONATHAN MARKS. He was the attorney that defended the fellow that killed John Lennon (I saw him interviewed years ago on the Larry King show). The boy in the upper left, with the striped shirt and his head partially obscured is NORRIS BOLTEN (SP?). 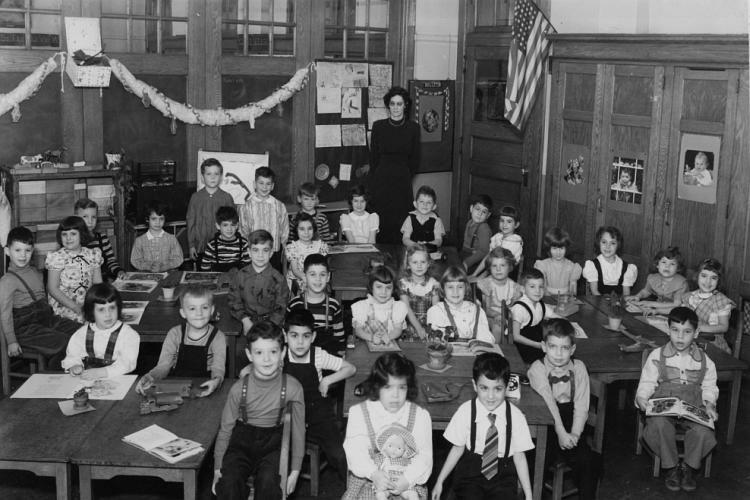 The second boy below the teacher to the right, with the tilted head and dark shirt is MILTON WERTHEIMER. I remember many of the other kids faces, but not their names. Our teacher's name was Miss CAREY and, I think, the principal's name was HENRIETTA A OLIVER." That's me with black suspender things beside the cupoboard that has the picture of the kid in jail. Diagonally in front of me next to Bobby Harmen is Stanley Fisher. In the very back in front of Mrs. Carey is a girl I think is Myra. Beside her is a boy in a striped polo and in front of him is Joyce Flateur. Jonathan Marks lived across from the park in one of those elegant houses. He became a ham radio operator and had a wow of equipment.